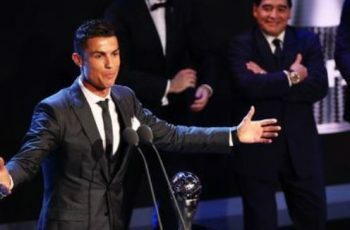 The UEFA player of the year award for 2018/2019 ceremony held tonight and the winner was announced amid tons of spectators and millions of viewers around the world. The award ceremony held simultaneously with the draw for the group stage of the champion’s league. Nominations for the award have been released earlier and Ronaldo, Modric, and Salah were the top three contenders for the title. 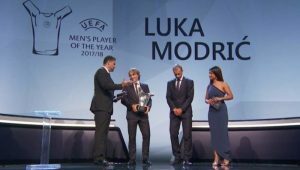 Modric emerged the winner of the three and the most prestigious award of the night, UEFA Men’s Player of the Year, was given to him. Forward of the Season: Cristiano Ronaldo (winner), Mohamed Salah, . 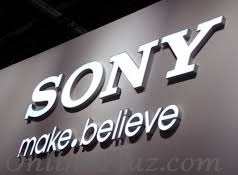 Thction process was done by 80 coaches of the teams and also looked over by 55 journalists. All the coaches involved were those that made it to the Champions’ league last season. Another highlight of the night has placed all the teams that qualified for the champions League in their groups. Also, Beckham was awarded the UEFA president’s Award and Cristiano Ronaldo won the best goal of the season for the overhead kick he scored against Juventus. Here is also the groupings for the UEFA champions league 2018/2019.